When you travel, where to try to keep your valuables safe is always an issue. On July 1, 2010, Carol A. Brown published a solution to this problem on Ann the Gran site. The solution? 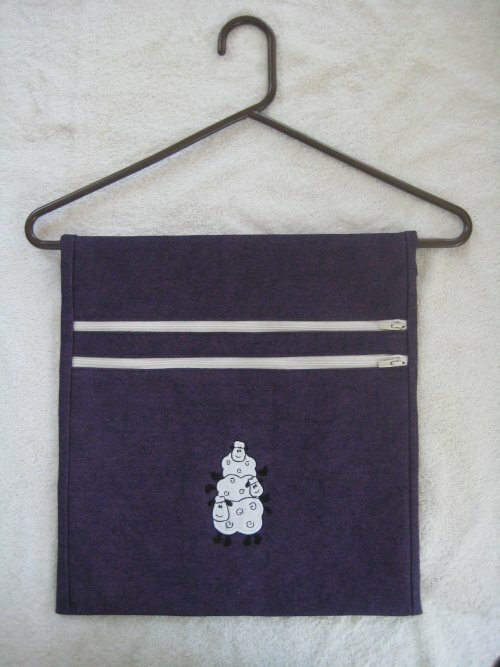 A caddy, hanging from a hanger, which has 2 zippered pockets. When you hanging your own clothing on the hanger, the pocket caddy will be hidden from immediate view. Of course, this isn't terribly secure .. just as "hiding" something under the motel mattress isn't terribly secure either BUT it will foil a quick look-see. Carol has put a lot of thought into this caddy. 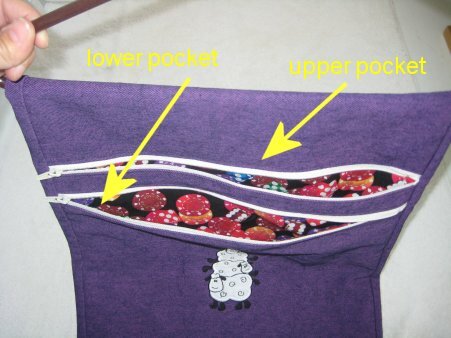 There are 2 full-length pockets secured by zippers that traverse the entire width of the caddy. What looks like "binding" on the sides, is really the *backing* fabric which is wrapped around the front fabric. The caddy is secured on the hanger by a strip of Velcro running width-wise across the back. Don't like her size? She also gives directions on how to make it longer. Carol shows her caddy with different colored zippers and a contrast backing, just to give you ideas on how to personalize your own version. I had some sturdy purple denim on hand and it was this fabric that I chose to make my caddy from. I also happened to have 2 white zippers, which were much longer than the caddy was wide, but that was OK ... once the zippers were sewn to the caddy pieces, the ends were zig-zagged shut secured and then trimmed to size. The ends of the cut-off zippers would be encased in the side seams ... no chance of the trimmed edges coming undone! I had quite a bit of the denim, so I chose to use it as my backing fabric rather than a contrast fabric ... which is why *my* caddy doesn't have the contrast "binding" on the sides, as Carol's does. For the pockets, a vibrant "casino" motif was used ... you could also choose to make each pocket out of different fabrics. Both of these pockets are full length: they each go to the bottom of the caddy. The upper pocket is naturally longer than the lower pocket. A simple but effective strip of Velcro across the back of the caddy allows it to be hung from a hanger without slipping off. One thing you do need to be aware of ... some plastic hangers have a vertical bar close to the curved ends of the hanger. The width of this caddy is too wide to fit between those vertical bars. Either don't use those hangers or adjust your caddy to be narrower. 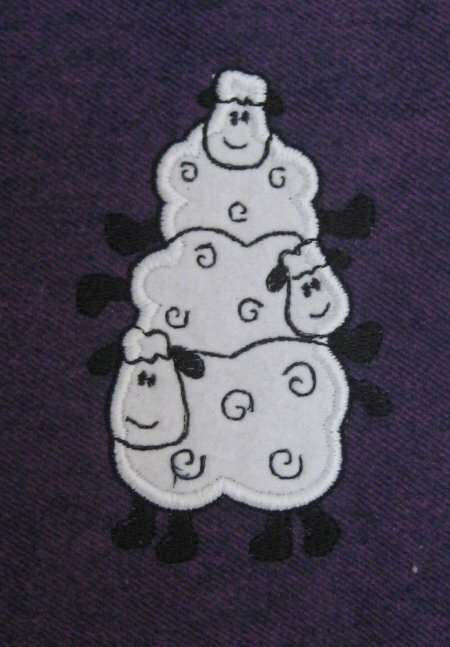 Finally, a cute little appliqued machine embroidery design of stacked sheep was stitched onto the front.